Do you want to take a dream trip to the Canadian Rockies this winter? Are you put off by the high cost of accommodation? Thinking about a weekend getaway but turned off when you see the rates on Expedia? We hear you. Prices keep rising and a trip to the spectacular Canadian Rockies becomes unachievable. What can a traveller do? The deals are incredible in winter, and we routinely get rooms for around $100 / night in Lake Louise – at hotels we like! Well, we’ve got our 10Adventures crew covered. We’re sharing our Insider Tips that we’ve cultivated over the past decade of savings options for the Canadian Rockies for the 2017/2018 winter season. We are sharing savings up to 50% on regular hotel rates, beating what you can find on Expedia or Booking.com. Check-out important details of these programs at the end of this document. Keep reading to find the best deals for a trip to Lake Louise! Why go to Lake Louise in winter? Stunning beauty and almost no crowds. Think near deserted ski hills (especially mid-week) and other incredible activities like winter hiking, snowshoeing, cross-country skiing and dog-sledding, this can be an incredible winter trip for you. Yes, we love Lake Louise in summer. But do you know what, we actually prefer it in winter. It’s not as crowded and it feels like there is more to do, and sometimes you have the whole places to yourself. 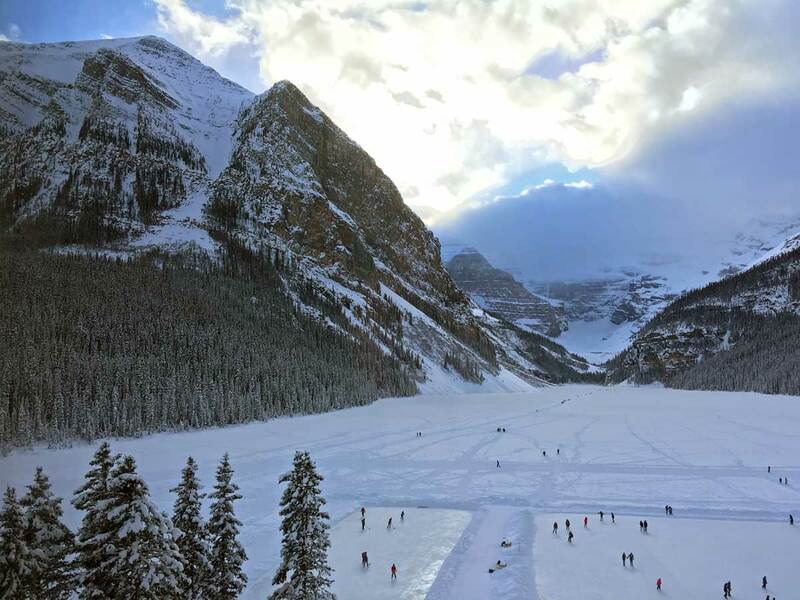 Consider that within 5 minutes of Lake Louise village you can downhill ski, cross-country ski, snowshoe, ice skate, go for a dog-sled or horse-drawn sleigh ride. Heck, you can even hike or ice climb! There are also incredible deals in Lake Louise. The best and easiest way to save money at Lake Louise is with the Ski Lake Louise Plus Cards. Sure, they cost $109, but they can save you thousands on your vacation. The cards have a similar structure as the Sunshine Super Card for Sunshine and the Marmot Escape Card in Jasper by giving you free days skiing. The real deals are that the cards have many more hotels, restaurants and attractions participating with savings up to 45% off! We know people that buy the card just for the discounts in the Canadian Rockies. The Louise Plus Card gets you 10-45% of a dozen other accommodations, and 10-20% off over a dozen restaurants. This card has such awesome potential that if you’re thinking of making a trip out here for a long weekend this is a must. Insider Tip: Louise Plus Cards can be bought online until December 31 each year. But don’t fret if you missed out, you can usually find cards on Kijiji or one of the many Facebook groups in Alberta throughout the year, with people selling (or more often giving away) their cards once they’ve used the free ski days. We love the Chateau Lake Louise. Though the rooms are a step down from the Banff Springs Hotel, the location makes up for it. It’s also very expensive, and usually outside of our budget. Well, let’s change that! To begin with, there is a discount for residents of Alberta and BC (promotion code PRE9). They will demand to see a drivers licence as proof of residency. But this 30% off discount eclipses what you can find on Expedia. But, if you’re not satisfied with 30%, then buy your Ski Lake Louise Plus Cards (only available until December 31st each year) then you can get access to rates up to 45% off. We like the $179 / room rate for midweek (it’s $199 / night on weekends). While there are blackout dates, this is a great deal. Use the PSKI code and prepared to show your Louise Plus card when you check in. Kids 5 and under eat free, if they’re 6-12 then it’s 50% off! But the best part for families is a little-known perk: kids eat free! Kind of. If your child is 0-5 they eat free but if they’re 6-12 it’s 50% off. This deal isn’t at every restaurant at the hotel, so confirm with the concierge before making your reservations. Want to stay a five-minute walk from the Chateau for under $100? Deer Lodge is a historical lodge just down the street from the Chateau. Your Louise Plus Card opens up $99-dollar rooms at the Deer Lodge. We love Deer Lodge, but we know many people are disappointed because it’s an old, creaky hotel and the rooms can be small. We love the rustic charm, so different from the 99% of other hotels that are all the same. The restaurant is great, and you can walk five minutes to the Chateau. You need to call the hotel (1-800-661-1595) to get the rate and present your Louise Plus Card when you check-in. The Lake Louise Inn is a great budget-friendly hotel in Lake Louise Village. Use your Louise Plus card to get 25% off available room rates. We love the condos and suites here. You need to call the hotel (1-800-661-9237) or use the Promo Code Season Pass on their website to get the rate and present your Louise Plus Card when you check-in. Most locals don’t know about Baker Creek Mountain Resort. Tucked away on the 1A highway (Bow Valley Parkway), fifteen minutes from Lake Louise, this area doesn’t see much traffic in winter. That’s a great benefit for you, as Baker Creek is a wonderful place to stay, with cute cabins that ooze Canadiana. You can get 15% off room rates using your Louise Plus Card. You need to call the hotel (1-403-522-3761) to get the rate and present your Louise Plus Card when you check-in. What an isolated gem Emerald Lake Lodge is. 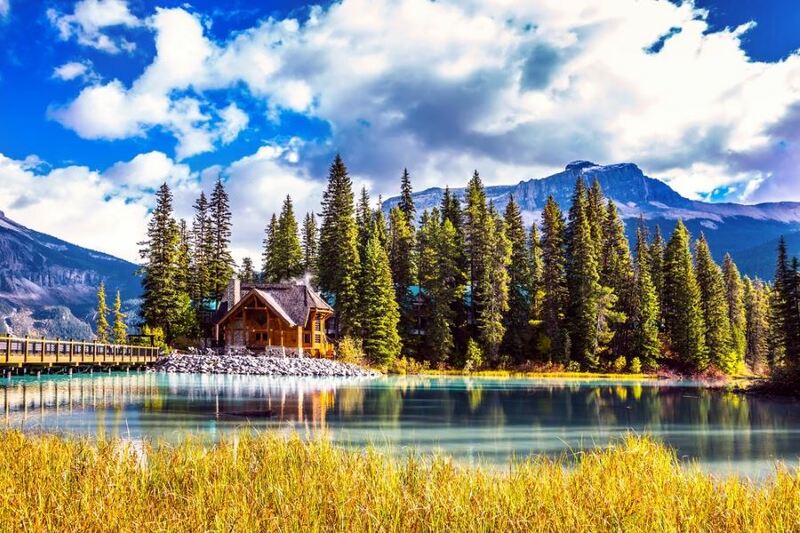 Tucked away on Emerald Lake, we love the tranquility here. There are no TV’s, no cell-phone, just fresh mountain air, log fires and great food. While summer sees the area overrun with tourists, winter sees incredible peace and some of the best deals in the Rockies. You can get a room for $119 / night mid-week using your Louise Plus Card. You need to call the hotel (1-800-663-6336) to get the rate and present your Louise Plus Card when you check-in. Most people don’t know about Field, and even fewer know about Truffle Pigs Bistro & Lodge. Field is located fifteen minutes west of Lake Louise. This charming little railway town is actually in Yoho National Park. There isn’t much here, but it’s a great base to explore and commute into Lake Louise. We love the casual and comfy lodge and the Bistro is one of our favorite places to eat in the Rockies. Get 20% off room rates midweek and 10% on weekends. You need to call the hotel (1-250-343-6303) to get the rate and present your Louise Plus Card when you check-in. 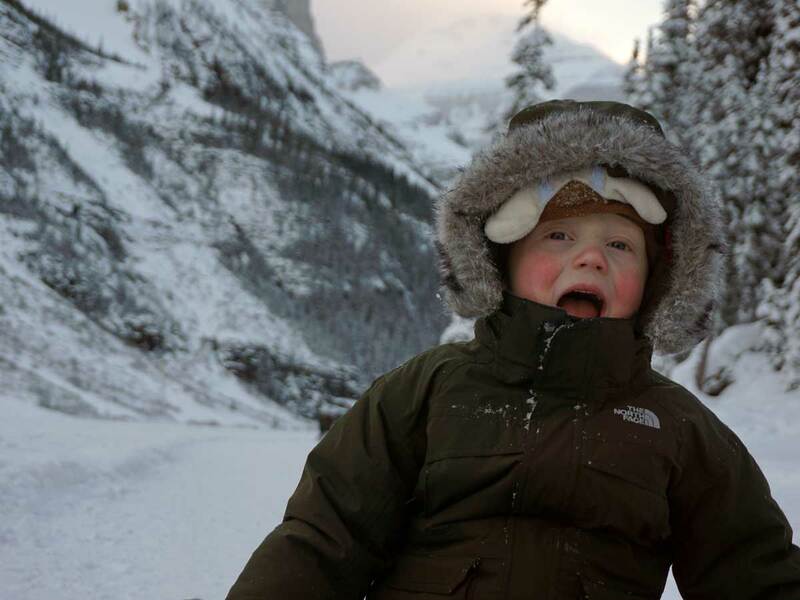 Lake Louise has the most family-friendly HI hostel we’ve seen. Not only do they have lots of family rooms for rent, but there’s also a kids play room, games, a TV room, Library, and a campfire pit. It’s often the cheapest option for families, and it has enough charm and character to make it special and memorable.